Call Robert J Malone, DDS as soon as possible if you have broken a tooth. It is important to determine if tooth decay caused the break and find out whether the nerve in the tooth is at risk. If the nerve has been damaged, root canal treatment may be necessary. Frequently, when a patient has a missing filling or a broken tooth, it will feel like the tooth is sharper, has changed shape, or become smaller. Using warm water, thoroughly rinse your mouth. Apply pressure with a cotton ball or piece of gauze on any areas that are bleeding. Maintain the pressure for approximately 10 minutes or until the area has stopped bleeding. If the bleeding doesn’t stop, apply pressure with a damp tea bag until it stops. If the tooth has a sharp edge, you can place cotton or orthodontic wax (available over the counter) on the area. If you can’t see a dentist quickly, use temporary dental cement (available at your local drugstore) to cover the remaining part of the tooth. Relieve the pain with over the counter pain medication. 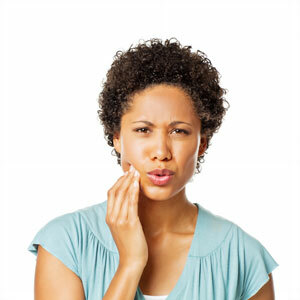 A slightly chipped tooth may not bother you, but a large or deep fracture can be quite painful. Avoid chewing on the area. A soft diet may be helpful. It isn’t always necessary to repair minor chips. It may require repair with filling material to make the tooth feel and look better or to prevent the damage from worsening. Polishing and smoothing the area may be all that is necessary to treat very small chips. When a cusp (the pointed chewing surfaces of the teeth) is broken, it is not likely to cause much pain or affect the pulp. It is necessary to repair the breakage to restore the shape of the tooth and prevent more of the tooth from breaking. Frequently, a crown or onlay will be necessary. In this type of break, the tooth has crumbled or broken because a significant cavity damaged it from the inside out. It will be necessary to examine the cavity and determine the best method for restoring the tooth. In many cases, if there is significant decay, the tooth may need root canal treatment or may have to be removed. These cracks extend to the root of the tooth. This type of break is frequently painful because the area around the root might be infected or inflamed. Usually, the tooth will have to be removed because it cannot be restored. Increase the chance of saving the tooth and avoid further damage. Call (760) 746-2559 and schedule an appointment.